Critics of US Arctic drilling say there are no proven, effective ways of cleaning up an oil spill in the Arctic. OffshoreTechnology.com photo. In order for the U.S. to keep domestic production high and imports low, oil companies should start probing the Arctic now because it takes 10 to 30 years of preparation and drilling to bring oil to market, according to a draft of the study’s executive summary obtained by the Associated Press. The study, produced by the National Petroleum Council at the request of Energy Secretary Ernest Moniz, comes at a time when many argue the world needs less oil, not more. U.S. oil storage facilities are filling up, the price of oil has collapsed from over $100 a barrel to around $50, and prices are expected to stay relatively low for years to come. At the same time, scientists say the world needs to drastically reduce the amount of fossil fuels it is burning in order to avoid catastrophic changes to the earth’s climate. But global demand for oil, which affects prices of gasoline, diesel and other fuels everywhere, is expected to rise steadily in the coming decades, even as alternative energy use blossoms, because hundreds of millions of people are rising from poverty in developing regions and buying more cars, shipping more goods, and flying in airplanes more often. 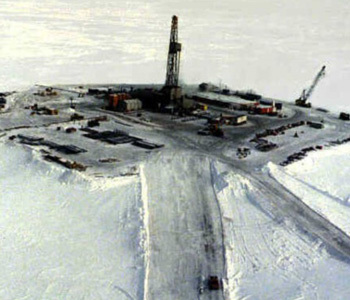 The Arctic holds about a quarter of the world’s undiscovered conventional oil and gas deposits, geologists estimate. While the Russian Arctic has the biggest share of oil and gas together, the U.S. and Russia are thought to have about the same amount of crude oil, 35 billion barrels. That’s about 5 years’ worth of U.S. consumption and 15 years of U.S. imports. The council’s study acknowledges a host of special challenges to drilling in the Arctic, including the sensitive environment, the need to respect the customs and traditions of indigenous peoples living there, harsh weather and sea ice. But the council, which is made up of energy company executives, government officials, analysis firms and non-profit organizations, says the technology and techniques needed to operate in the region are available now, and the industry can safely operate there. The report contends the industry has developed improved equipment and procedures to prevent a spill and clean up quickly if one occurs.